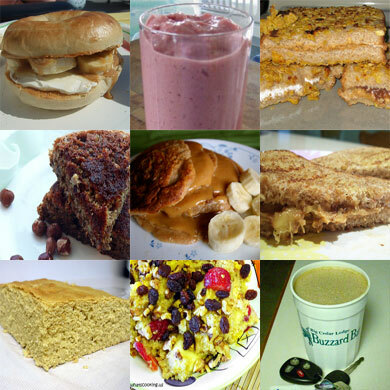 *Posted from the archives for all the delicious recipes! I said it before and I’ll say it again: this was difficult. Even with the help of e from Foodaphilia, I had a tough time judging. Truly, all of the submissions were excellent, but we promised to choose a top 3. Like the troopers we are, we finally decided on the winners. We got a few less entries this time and most of them right near the deadline! It’s too bad we didn’t have more, but at least it was easier to judge (slightly). So what did we receive? It can be broken down into the following: 2 smoothie, 3 bread, 2 sandwich, 1 parfait, 1 pancake, 1 french toast and 1 quinoa dish. For all you mathematicians out there, that’s 11 total entries. I chose my top 3 in the evening which led to stomach rumblings. It didn’t help that my own breakfast was at least 10 hours away at that point and I dreamt of all of the entries in some mega breakfast feast. Every submission was outstanding, ranging from quick and easy smoothies to the more involved but equally delicious Breakfast Panini and Stuffed Pancakes. Quinoa? For breakfast? Hell yea! I only wish my printer could print me out a plate of that. How about some Hazelnut Pan Bread from Naomi who can’t find the # symbol on her keyboard but can make a superbly unique breakfast treat. And who could forget Bagels! Although depending on where you’re from, the bagel can either make it or break it (anyone west of Philly need not apply). Well, the time has come, so read on to see the winners of the Second Peanut Butter Exhibition! Congratulations to the winners! You’ve dazzled our minds and left us drooling for more. You’ll each receive winners badges to place on your site and declare your dominance in the field of peanut butter breakfast making! 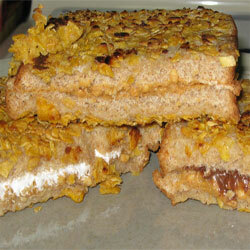 1st Place: Peanut Butter Crunch French Toast from Heidi over at Baking Buddies. This entry was incredible. A simple and well balanced recipe that can be easily modified. One with marshmallow fluff and one with Nutella? Are you crazy? A little decadent perhaps, but the mere thought of it would wake me from the deepest slumber. 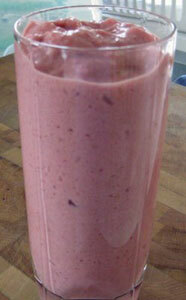 2nd Place: PB&J Smoothie from Giz at Equal Opportunity Kitchen. Simple, yet effective. Especially with summer approaching, what could be better than waking up to a bright hot sun and downing a delicious frosty beverage? Again, easily modified and well-balanced to boot, this one came in at a close second. 3rd Place: Peanut Butter-Peach Breakfast Parfait from Rosiecat at Life, Love, and Food. Unfortunately, there is no picture to go with this one, but the main component of this delightful breakfast is a homemade Peanut Butter-Glazed Granola. Sure this one scored a bit lower for prep time, but while staring at the ingredients (and wishing for a taste…or even a picture! ), I could smell and taste this entry more than any of the others. One can only imagine the aroma that would fill the house from this delectable baked treat. – Peanut Butter Quinoa Breakfast from What’s Cooking? The last recipe is from Katrina Johnson who does not yet have a blog. Her recipe is for “Surprise Sunrise Peanut Butter Muffins”. This is one of the most unique recipes we received and I will certainly be trying these myself. Directions: Heat oven to 375 F. Combine flour, baking powder, and brown sugar in a large bowl. In a small bowl combine PB, applesauce, soymilk, and agave nectar, and mix well. Pour the wet mixture into the bowl of dry ingredients and gently stir to combine. Line a 12 muffin pan with paper cups. Fill the lined cups 1/3 full. Make a shallow indentation in the center of the batter with you finger; do not go to the bottom, and place a teaspoon of the apple jelly in each indentation. Place a cooked half sausage patty on top of each muffin cup. Fill muffin cups with batter about 2/3 full. Bake about 20 minutes until golden brown. Remove from oven and allow to cool in the pan for about 5 minutes. Place muffins on wire rack to cool until just warm. Serve and ENJOY! – Chocolate/Peanut Butter Frosted Banana Cupcakes from Girl Meets Cupcake receives the “I don’t read past the first sentence of emails” award =). A big thanks to everyone that entered! Once again folks, stock up on peanut butter and get ready…the next Peanut Butter Exhibition is just around the corner! Thanks for hosting another lovely peanut butter event. That first-place winner looks delectable and it makes me wish today were Saturday! Thanks for hosting the event! Those surprise muffins sound very, very good, and I like anything that has a surprise in the middle. All I can say is YUM! Bring on the next contest, with graduation parties and Relay for Life behind me, I’m ready to start cooking again! Those look delicious! I can’t wait to give them a try. There’s some very creative choices there. hey peanut boy, here is a recipe for a tofu pie, might taste better than the black bean brownies? tell me what you think, or make it and Ill taste it? aforkful, Haha, I hope I chose correctly, but in my mind everyone’s a winner! rosiecat, renae, Glad you entered and congrats! veggiegirl, sagan, Enjoy the recipes! lisa, Good! I hope to see you enter next time. We’ll be posting the next PBE earlier this time to give people more time for submissions! deener, Yea, I saw the recipe a few weeks ago, it looks really good. If you’re reminded of the black bean brownies because of the reference on that site, I didn’t make those specific ones. Those ones have a ton of butter, which is what the black beans are meant to replace. The ones with butter are probably better, but just so you know, I’m making round 2 of those brownies for this weekend and your housewarming party! Thanks guys…that was fun – anything with peanut butter is fun – just talking about it sends me to the kitchen – yeah…I think I’ll have some right now. Thanks again for hosting. i’m going to figure out how to make a peanut butter flan just for you! I missed the deadline on this one! Are you going to have another? Do you watch Top Chef? One of the chefs made Peanut butter mashed potatoes…i’m dying to try them. Great post. I bet it was a hrd job to judge! Looks like you did well.